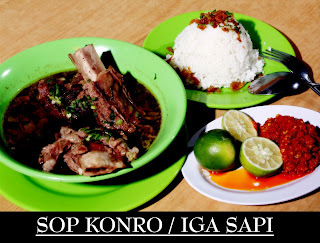 Talk about looking for food pleasures of the archipelago, of course, grilled ribs menu or the more popular by the name of fuel in the RM anging konro Mamiri, was already familiar. In Batam, foods derived from Makassar, Sulawesi is also easy to find. But of the many restaurants serving a menu, just anging Mamiri Restaurant is no different flavor Kondro we eat in the area of origin. "Yes, it's because we use a recipe handed down from family members and even spices here (Batam) hard we can, we will bring direct from South Sulawesi," said Hepsty, anging Mamiri restaurant owner yesterday, opening the delicacy of her cooking. Not only kondro fuel, RM anging Mamiri located at Jalan Raja Ali Haji, Komplek Sampurna No. 2 and 3 Jalan Raja Ali Haji precisely located at Simpang Landslide, Batam, also serves other dishes such as: Coto Makassar, Sate Makassar, Sop Konro, Fish soup and rice meal replacement, domestic poultry and diamond. "There are some menus that we adopted from other areas such as soto terrain and fish soup, it's because we want mengkomplitkan menu at our place," he continued.On the beverage side, RM anging Mamiri also provides a full menu of typical ocean Makassar, call it Butung ice hammer, ice mixed rainbow, lime juice and other soft drinks. Well, this time to pamper their customers, RM anging Mamiri also provide membership card with exceptional facilities, not just dining discounts in place, but also disco parlor car. "For consumers who shop over 100 thousand, we will provide membership card with a profit of 10 per cent discount to its food, free ice hammer stump, also a 10 percent discount car air conditioning service, parlor car and the car wash at Oney Air Conditioner," he said. Opportunity to get this member, described by Hepsty only during the month of October alone. "If force members all know," he concluded. Yes, for those who want to enjoy good food and pulangh-home cars are clean and neat, wait no more, soon join a member anging Mamiri, guaranteed nothing to lose.